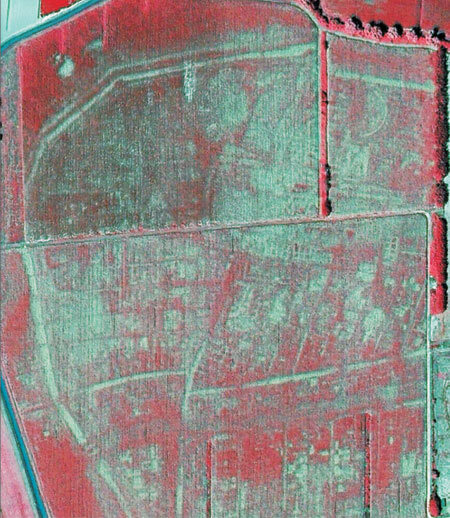 Archaeologists knew the ancient Roman city of Altinum was underground somewhere just north of Venice, but it’s been farmland for a thousand years and there are no standing ruins whatsoever. Thanks to a severe drought and the marvels of aerial photography, now the whole city can be seen again without anybody digging an inch. People began to flee Altinum starting in the 5th century when Atilla invaded Italy until finally the 7th c. Lombard invasions drove the last inhabitants to the more defensible lagoon islands. Then what with the marshy terrain and the “borrowing” of building materials, the city disappeared and cultivated land took its place. That makes Altinum a very rare thing indeed: a prominent Roman metropolis that was never rebuilt. You can see why archaeologists were keen to find it. In July 2007, during a particularly dry summer, crops were suffering from drought and were highly sensitive to the subsurface presence of stones, bricks or compacted soil. On the image taken by the mapping company Telespazio, the lighter crops indicated stonework, while the darker patches revealed depressed features such as pits and canals. 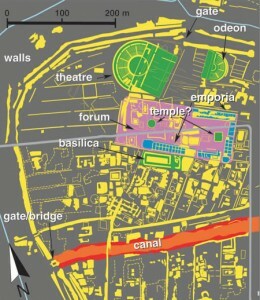 The team, reconstructing the town using the aerial images and knowledge of Roman architecture, was able to identify temples, theatres, a basilica, the marketplace and city walls as well as hundreds of smaller structures. 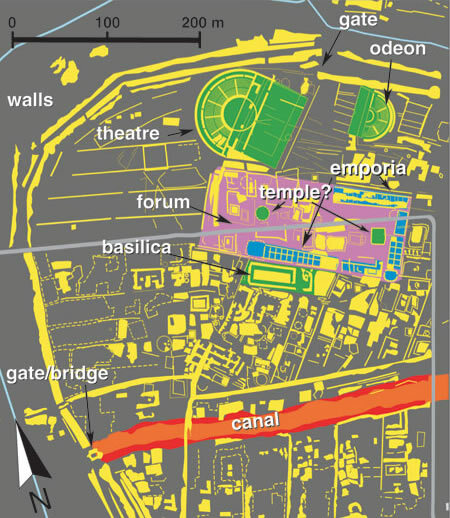 Also visible is a large canal, which would have been used for the transportation of oils, wines and foreign luxuries inland to the Roman capital of Milan and other powerful cities such as Verona. “Everything is just as it was. When we saw the picture we couldn’t believe it,” said Alessandro Fontana, an archaeologist at the University of Padua and a co-author of the paper, which is published today in the journal Science. Here’s a link to the full Science article, although it’s available only to subscribers of which I am sadly not one. I did manage to find the pictures, though, so without further ado, meet Altinum, aerial photo on the left, map on the right. This entry was posted on Saturday, August 1st, 2009 at 6:46 AM	and is filed under Ancient, Multimedia, Roma, Caput Mundi. You can follow any responses to this entry through the RSS 2.0 feed. You can skip to the end and leave a response. Pinging is currently not allowed. So glad you managed to get the photos. (How did you DO that?) Seeing is believing. But still … this is hard to believe. Too good! I just searched the Science site until I found a press release. Press releases are where it’s at when you’re looking for pictures not included in a news article. It’s amazing, isn’t it? There’s talk of excavating the town now that it’s been pinpointed so clearly, but that’s far in the future. Fascinating!!! I live rather close to an area in Germany were they discovered Celtic burial grounds and foundations in a similar manner after someone saw it while flying over the area in a plane. It’s amazing how ancient remains can become topographical features. You don’t even need a plane anymore. Now that we have the likes of Google Earth, you can make major archaeological discoveries nekkid in front of the computer.